Solvay, a leading global supplier of specialty polymers, introduced Solef® 90615/2002 polyvinlylidene fluoride (PVDF) today at the Offshore Technology Conference in Houston, Tex. This new high-performance polymer is designed to improve the capabilities of steel pipes, flexible risers and flowlines used in oil and gas recovery. Combining high ductility, thermal stability up to 150°C (302°F) and exceptional resistance to oilfield chemicals and fluids, Solef® 90615/2002 PVDF delivers reliable performance despite the high temperatures and pressures required for oil transmission in onshore and offshore environments. “Solef® 90615/2002 PVDF introduces a unique combination of high-performance properties that can help expand design options, improve the lifetime of oil and gas assets, and lower operating costs over the lifetime of the pipe,” said Mike O’Brien, oil and gas market manager for Solvay’s global Specialty Polymers business unit. Liners made from Solef® 90615/2002 PVDF are easily inserted into steel pipes due to the material’s high ductility and elasticity. Once inserted, the PVDF liner’s high chemical resistance helps slow corrosion, while its low-stick, ultra-smooth surface supports more consistent flow rates and flow assurance over time. Solvay’s new PVDF grade also reduces the need for corrosion inhibitors, antibacterial agents and other additives. The polymer’s excellent thermo-mechanical properties and resistance to permeation of gases, such as methane and hydrogen sulfide, further promote long-term liner integrity. Solef® 90615/2002 PVDF’s ductility also offers benefits in flexible pipes as a pressure sheath material, particularly in high-pressure applications. It delivers reliable performance across temperatures ranging from 30°C to 150°C (-22°F to 302°F), reducing the risk of rupture during installation in colder climates and expanding options for use in newly drilled, hotter fields. The material can also resist blistering in rapid gas decompression up to 1500 bar. 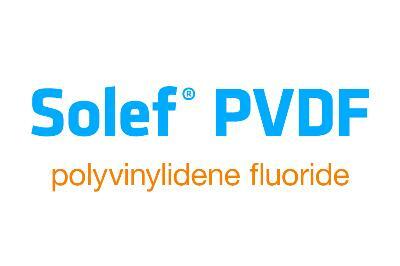 ® Solef is a registered trademark of Solvay.